The Geek Culture Forums! : Whiffling goose! » The Geek Culture Forums! » Techno-Talking » Science! » Whiffling goose! For some reason I find this so cool. 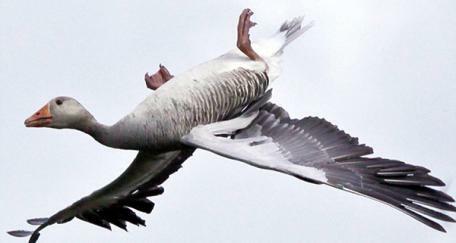 A greylag goose was captured by wildlife photographer Brian McFarlane in a manoeuvre known as whiffling, where the bird flips upside down in order to rapidly lose altitude. __________________ Hi All __ Since we have a full horizon view, minus a few degrees. We get to watch a lot of birds. A couple of years ago I pointed out two sparrows tormenting a hawk, eventually driving it away. Now the Mrs. thinks that sparrows are mean birds, I keep telling her that they are just trying to protect their own. Your wife is right, MoMan. Sparrows are mean. They have to be, since they aren't a natural part of the food chain. They're not native to the United States. Our park naturalists have told me many stories about how sparrows torment the native songbirds. Sparrows... ...aren't a natural part of the food chain. __________________ The Famous Druid __ Speaking about Cats. The real comedy was last year our cat (Muffin) was actually stalking a Sand Hill Crane. I am unsure what she would do if she came face to face with a bird of that size, I think it would have been fun to watch. When I was a lad I watched the woods Owls get barn rats (after we put the dog in the barn the rats would run) there is no sound until the rat screams. My Uncle called putting the dog in the barn feeding the Owls, this was back before TV and we would be setting on the porch of the farm house, Uncle Chuck would say "time to feed the Owls, put the dog in the barn", we would have about ten minutes until the owls stopped swooping. Watching an owl swoop or take off is good watching, they sort of lean forward and topple towards the ground about half way to the Earth they start opening their wings and glide to the target. When I was a kid, Clan McDruid had a pair of cats with attitude, they used to lie in wait for dogs passing our house, and ambush them. The sight of 2 cats chasing a german shepherd half way up the hill was hilarious. We had a cat that chased our dog, but this cat takes the cake for treeing a bear twice, even though he'd been declawed. My aunt's cat catches lizards. My cat stalks and pounces the light from a laser pointer. And gets mighty confused when, after he's "caught" the red dot, it appears right on top of his paw!